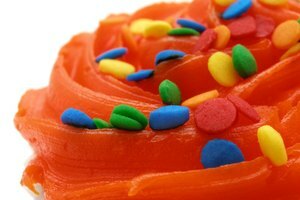 Jell-O gelatin powder added to frosting adds both flavor and color, eliminating the need for food coloring gels and flavor extracts. Flavor extract options are limited, Jell-O powders come in a range of flavor options, including tropical fruit flavors. 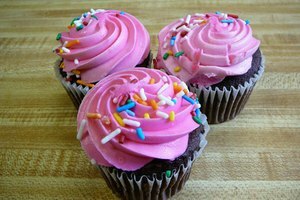 Mix the gelatin powder in store-bought or previously mixed frosting, or mix it in as you make a fresh batch of frosting. Add butter, vegetable shortening, or a combination of the two ingredients to the mixing bowl. A true buttercream is made with only butter, but you can substitute shortening for one-half or all of the butter in a buttercream recipe to make a crusting buttercream that hardens as it dries and has a higher melting point. 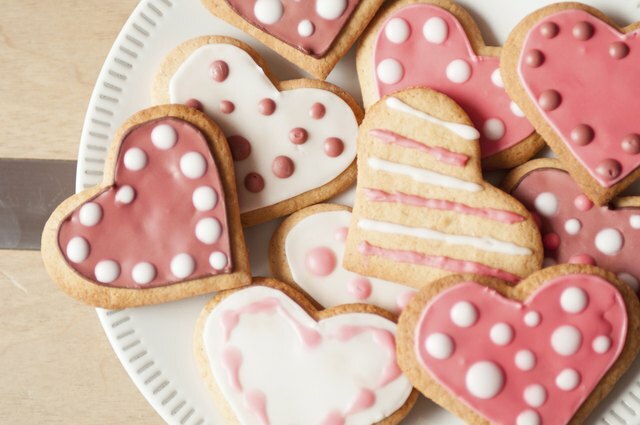 You'll need roughly 1 cup of butter or shortening for every 4 cups of powdered sugar in a frosting recipe. Mix the butter or shortening at medium speed until smooth and soft. Add vanilla extract to taste, if you wish, and blend it into the smooth fat. Sift powdered sugar into a mixing bowl to remove any lumps. Use 4 cups of powdered sugar to make 2 1/4 cups of finished buttercream frosting. Mix the sugar and butter on medium speed until thoroughly combined and crumbles form. Add milk to the sugar and fat mixture while mixing constantly until peaks form and the icing is a spreadable consistency. You'll need 1 to 2 tablespoons of milk for every 4 cups of powdered sugar. Start with 1 tablespoon and slowly add milk until you achieve the desired consistency. Add 1 to 2 tablespoons of Jell-O powder to the frosting. Mix at medium speed until the powder is thoroughly combined with the frosting and completely dissolved. Scrape the sides of the bowl to remove any gelatin powder that accumulates on the sides. Mix this powder into the frosting. Stop the mixer and check the frosting for color and flavor. With such a small starting amount of Jell-O powder in the frosting, you should notice only light tinting and a hint of flavor change. Add more Jell-O powder to the frosting 1 to 2 tablespoons at a time, if you wish. Mix until thoroughly combined and stop to check the results. Continue adding the gelatin powder a little at a time until you achieve the desired flavor and color. A full box of gelatin powder, typically 3 ounces, results in a bold color and flavor when added to a 2 1/4 cup batch of frosting. Add more finished frosting to the Jell-O powder frosting if you've added too much powder. Mix the frosting in a separate bowl and add it to the gelatin powder frosting a little at a time until you achieve the desired results. 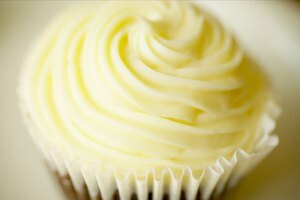 This basic buttercream frosting can be used to decorate cakes or cupcakes. If you prefer a different type of frosting, such as cream cheese frosting, prepare the frosting as usual and mix in the gelatin powder a little at a time. This also works with canned frosting purchased from a grocery store. Scoop the canned frosting into a mixing bowl and add gelatin powder slowly to achieve the desired result.